One of the most interesting innovations in car design of the last few years is how computer modeling has helped the driver to see the road and feel comfortable behind the wheel. It’s not a happy accident anymore that a modern car seems to drive in a way where you can see out in front of you and to the sides, and that the interior seems to flow evenly from the seat, to the arm rests, out to the dash, and beyond to the hood and to both sides. It’s interesting to note that engawa is a term that started when the Japanese were building gardens. The idea is that you can sit on a porch or near your house and see how the garden unfolds form the house in a natural way. With car design, it’s all about apps like Maya Design that help designers envision how the cockpit will look, how it flows out to the hood, the colors and placement of controls, and the sight lines. It’s even more important on the UX 200, which has an extremely tight turning radius (a curb-to-curb turning diameter of 34 feet). Blind spots on smaller cars like the UX 200 are a real problem, obscuring your view of traffic and road-side objects. They make smaller cars harder to drive. I can say that, after a week of testing, the typical blindspot issues were not as prominent. It’s a testament to the current design process with modern cars that this is even possible, because the computer models help designers create hundreds of different angles for the driver. 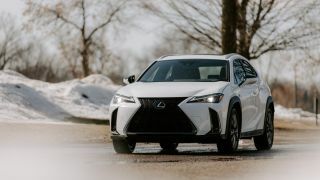 There’s not as much guesswork these days about whether the driver will be able to see in a brand new crossover model like the UX 200, which has obviously never been field tested before. In the UX 200, there’s a center console touch pad you can use for adjusting climate settings, the radio, and initiating a phone call. Knobs on the top are for controlling volume; on the left, you can tune the radio. It took me a bit to get used to the controls, since Lexus is so unique in this layout Audi also offers a touch pad – the idea is for drivers to keep looking straight ahead and now have to look down at the controls. What impressed me though is that it all seemed seamless. How cars are designed will continue to change, especially as autonomous vehicles become more viable. Designers won’t worry quite as much about how the driver can see if the vehicle drives itself, but will model the interior for productivity, social interactions, and even as a way to block out distractions as the car drives through an urban area. The modeling will obviously become even more important at that point, because there will likely be an in-between period with future cars where the driver will need to control the car at times and then hand over control. That’s a ways off, of course. For now, the UX 200 is all about letting the driver see everything clearly, and to feel like they are in a cocoon of comfort.